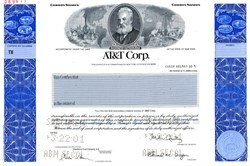 Beautifully engraved specimen certificate from the AT&T Corp. printed in 2001. This historic document was printed by the Security-Columbian United States Banknote Company and has an ornate border around it with a vignette of an Alexander Graham Bell. This item has the printed signatures of the Company’s Chairman of the Board, Michael Armstrong, and Treasurer, and is over 10 years old. SBC Communications bought AT&T for $15 billion, and changed the SBC name to AT&T. With the age of computers and the Depository Trust Company, securities no longer need to be in certificate form and can be registered and transferred electronically. This process is called Dematerialization which is the move away from physical certificates to electronic book keeping. Actual stock certificates are slowly being removed and retired from circulation in exchange for electronic recording. ATT is the first major company to no longer issue paper stock certificates. Other companies will follow to save costs, since they are no longer required to issue paper certificates. This item is the last certificate issued by ATT prior to the Comcast transaction.